Holding or rearing fish in cages is a traditional practice in some Asian countries and appears to have originated almost two centuries ago in Kampuchea, from where it spread to Indonesia and Thailand and, in recent times in a more advanced form, to several other countries. Holding or rearing fish in cages is a traditional practice in some Asian countries and appears to have originated almost two centuries ago in Kampuchea, from where it spread to Indonesia and Thailand and, in recent times in a more advanced form, to several other countries. Coche (1979) summarizes the historical evolution of the concept. It was a general practice in the Great Lakes area of Kampuchea to hold commercially valuable fish in bamboo cages to be sold alive. The cages were trailed in water behind a fishing boat for transport to the markets. Since this often took a long time and some of the catches were of smaller size, the fishermen began feeding them with trash fish and kitchen refuse. The fish grew well in the cages and as a result their market value increased considerably. 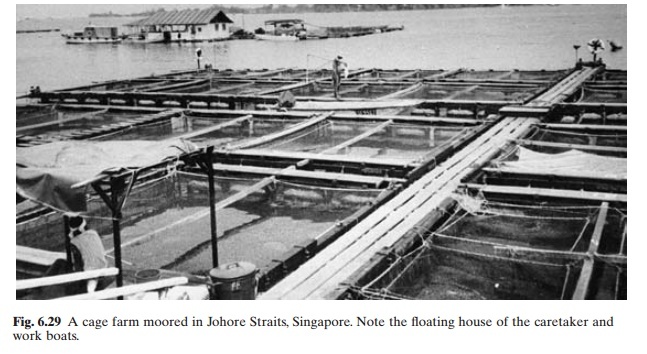 This naturally led to longer-term rearing of catfish in Thailand, carp in sewage-fed canals in Java (Indonesia) and later on yellowtail in Japan and groupers and sea bass in Hong Kong and Singapore. Through recognition of the value of cage farms in aquaculture and the opportunities they offer for productive use of open waters, cage culture has attracted considerable research and development efforts in most parts of the world. In the last three decades it has become a major source of aquaculture production, particularly of high-valued species like salmon, trout, sea bass and groupers. Several types and designs of cages and cage farms have been developed and are available commercially.